One of the reasons why I started studying Chinese is because the beautiful and mysterious-looking characters fascinated me. I always dreamed of walking through a busy street and seeing nothing but flashing signs in Chinese. It’s fun and all, but after a while you probably want to know what those characters mean. Perhaps you even want to be able to write proper Chinese yourself! If you want your Chinese writing to be successful, it is essential to follow the correct stroke order. If you don’t consider the order in which each stroke is written, the character might become illegible and Chinese people won’t be able to understand what you are trying to express. But if you use the following five tips to help you master Chinese character stroke order, you’ll be in great shape! 1. Know and follow the eight basic stroke order rules. The Chinese language is a very straightforward and systematic language, especially the characters. Each character must be written in a certain way in order to be 100% accurate. Therefore, it’s absolutely essential for Chinese students to follow the stroke order rules. 3. Left vertical stroke (usually) before top horizontal stroke. 4. Bottom horizontal stroke last. 5. Center stroke before wings. 6. Horizontal strokes before intersecting vertical strokes. 7. Left-falling strokes before right-falling strokes. 8. Minor strokes (often) last. Confused yet? Don’t worry! You will master these rules in no time if you take the following tips to heart. Get yourself a special textbook just for practicing the stroke order. I can highly recommend “Basic Chinese Characters and Radicals: A Dry-erase Practice Workbook.” This book is actually designed for overseas Chinese children to learn to write, but it’s excellent for every Chinese language learner! 2. Use mnemonic aids to remember Chinese characters. Next, get a feeling for the characters. You have to understand how Chinese characters were created in order to master stroke order. There are characters that are direct pictograms of the object they are describing, for example 日 rì for “sun,” 月 yuè for “moon” or 木 mù for “tree.” Rather easy to remember, right? However, pictograms only amount to about 4% of all Chinese characters, and there are over 100,000 characters in the official Chinese character dictionary, Zhōnghuá Zìhǎi. Good news, though: Most characters (about 82%) are phono-semantic compounds, which means that they consist of one set of characters which are pictographic and another whose pronunciation suggests the pronunciation of the character. It’s always easier to remember a word or a character with a little imagination. Chinese is ideal for that due to the symbolic nature of the characters. A great way to enjoy the process is to ask a friend or family member who has absolutely no knowledge of Chinese what they think a certain character looks like. Sometimes we can’t see the wood for the trees, and outsiders have a better eye for it than we might have ourselves! 3. Make good use of online resources. How do you know how to write a character properly? Sure you can keep to the eight ground rules, but isn’t there a quicker way to figure it out? Yes! Yellow Bridge offers an animated image of each Chinese character in the correct stroke order. You can even adjust the speed and choose between simplified and traditional characters. There are many other resources here that will help you improve your writing! In the beginning, you should probably check the stroke order of each new character you learn in order to get used to writing in Chinese. Later when you feel more confident about your writing and make less mistakes, you can only look up the difficult characters. Also, the key is to practice hard! Try to repeat old characters from time to time. Nothing is more frustrating than when you spent hours learning and memorizing how to write Chinese characters, and then later forget almost everything because you only use text messaging. 4. Play games and do fun exercises to learn stroke order. Writing Chinese characters and memorizing their stroke order is pure horror for most students. What could be more boring and dull than sitting at your desk for hours writing 我 wǒ (I) 100 times? That’s why you will achieve better and quicker results if you make Chinese characters fun and interesting. A great way to do so is using various apps, like Skritter. This application forces you to always write charactersfrom scratch. It’s a fun and effective way to learn to write Chinese characters. Another great app that will let you learn characters with writing is FluentU. FluentU lets you learn Chinese with real-world videos like music videos, movie trailers, news, and inspiring talks. FluentU takes such content and changes it into Chinese learning lessons. You can practice your Chinese writing on the FluentU app from the iTunes or Google Play store. The best part of FluentU is that always helps you learn the words with plenty of context. Another great character game is offered by Chinese Writer App, which kind of works like Tetris. You need to write the character correctly before it reaches the ground, and you lose if too many characters get stacked up on each other! The app can be downloaded for free and measures your progress continuously. 5. Take a calligraphy class or try learning the art on your own. You want to learn how to write in Chinese? Why don’t you try calligraphy? The tradition of Chinese calligraphy is as old as the characters themselves, with a teaching history of over 4,000 years! It’s beautiful art that is appreciated far beyond the borders of China. What better way to practice writing characters than by combining it with a cultural aspect? I have tried calligraphy myself, and it really helped me to obtain prettier handwriting in Chinese, plus it’s a great gift idea for birthdays or Christmas! A self-made calligraphy painting is a great decorative item for an apartment or office. Do know, however, that the right equipment is key for success. 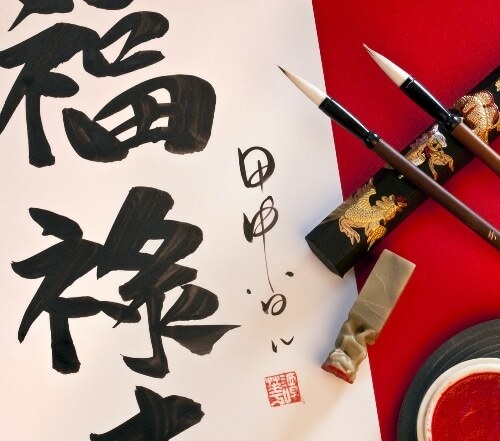 The standard tools for calligraphy painting include a brush, ink stick, ink stone and paper. If you don’t want to invest in these tools, though, you can also go ahead and purchase special markers, like the fude brush pen from the Japanese stationary brand MUJI. Then, get yourself a guide on how to write calligraphy. I have used the book “Chinese Calligraphy Made Easy: A Structured Course in Creating Beautiful Brush Lettering” for years and it’s a great addition to your Chinese-related books. If you have all your tools and are ready to go, remember: Patience is bitter but the fruit is sweet! Even Chinese people have trouble writing and remembering all of the thousands of characters. They practice during nearly their entire academic lives, up until high school or university, to be able to write the largest amount of characters correctly. If you are interested in the best Chinese character masters in China, take a look at the famous TV show “中国汉字听写大会 (zhōng guó hàn zì tīng xiě dà huì),” a Chinese characters dictation competition where contestants write Chinese characters after hearing the words. The show now broadcasts on CCTV 1, but you can watch it online here. As you can see, learning how to write in Chinese is both fun and hard work, and even native speakers have their problems with the characters. However, if you keep to the five tips mentioned above in a steady routine, you will be able to master Chinese in no time. Always remember to be patient and don’t rush! Good luck!